Though not a particularly popular brand in the US, Gigabyte has earned some loyal fans (one of them being our very own Chippy!) thanks to their ability to make quality computing products. Now Gigabyte has entered the Ultrabook segment with the U2442 “extreme Ultrabook”, as they’re calling it. There are two variants of the U2442: the U2442N and U2442V (which is the one that we’ve got); the only differences is the processor (Core i5 vs. i7). There’s also talk of a non-Ultrabook version which is likely to be referred to as the U2440 — be sure not to mix them up! 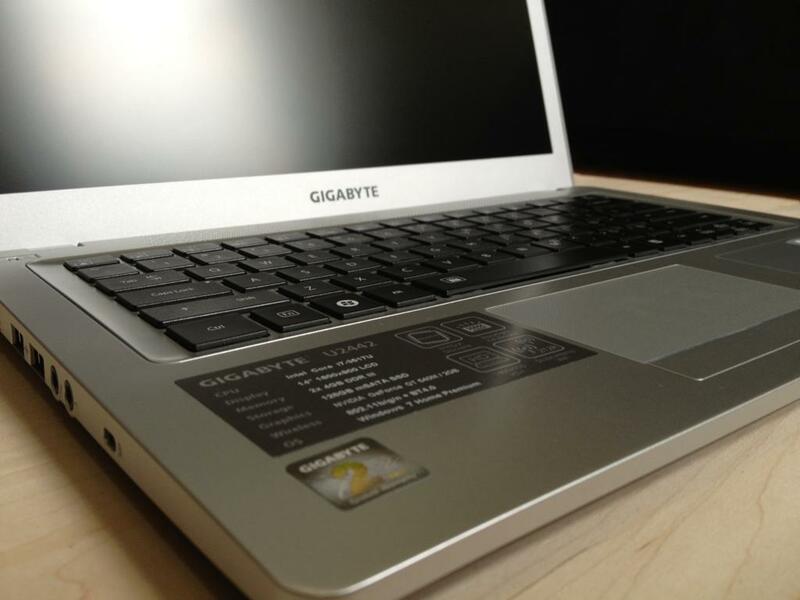 Does Gigabyte’s first entry into the Ultrabook realm stand up to their prior products? Step inside to our full U2442V review to find out. 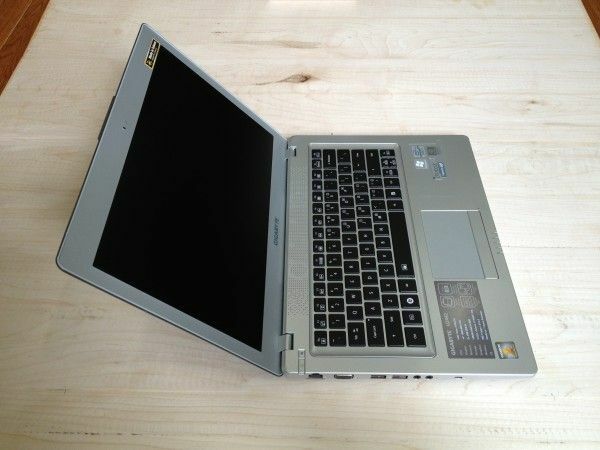 Our pals at Dynamism sent us over the new Gigabyte U2442 Ultrabook with discrete graphics to have a look at. Gigabyte is also launching non-Ultrabook versions of the U2442, but the U2442V which we’ve got is the high-end Ultrabook model. Pretty much every spec is what you might ask for from an ideal Ultrabook. I’ve been using the U2442V for a few days now and have some initial thoughts to share about this performance powerhouse. Acer America has just announced two new Ultrabooks as part of a new ‘Timeline Ultra’ series. On offer is a 14″ and 15.6″ display, the latter of which has a full numpad on the keyboard. The bezels appear to be nice and thin but the resolution leaves much to be desired. Discrete graphics from Nvidia are included as well as optical drives. Both come in at rather affordable prices, but we’re unsure that the inclusion of the optical drive is such a great idea. Another huge day for the Ultrabook world as Computex gets started on day one! Most of the big surprises like the Asus TaiChi and Transformer Book were outed on Day 0, but there was still a flood of exciting news today. 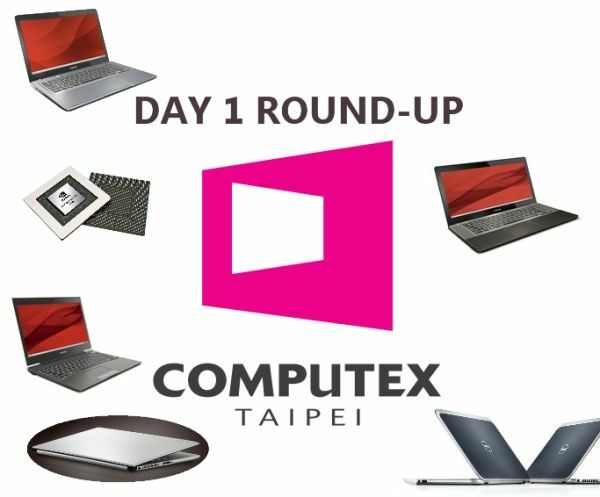 We worked hard to bring you detailed coverage here at Ultrabook News and now we’ve got a handy round-up of all the Computex Day 1 news; come on in and check it out! 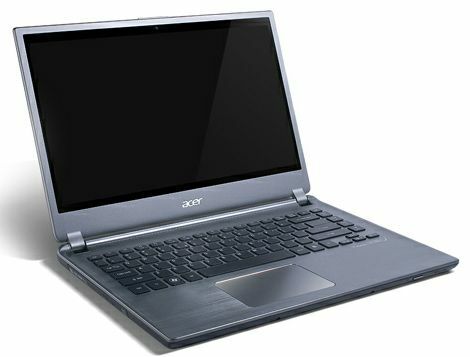 If you’ve got an Ultrabook, it likely has either integrated Intel HD 3000 graphics or discrete Nvidia GeForce graphics. Recently we gave you 6 excellent game suggestions for your Ultrabook. Now we’ve got a suggestion to make sure your Ultrabook is running those games as well as possible. One of the best ways to keep the graphical capabilities of your Ultrabook performing at maximum capacity is to ensure that you’re using the latest driver for your graphics card. Intel and Nvidia regularly update their GPU drivers to address bugs and other problems. Sometimes there are game-specific fixes, and other times there are general performance-enhancing changes. In this article I’ll show you how to quickly and easily update your Ultrabook’s GPU drivers in order to maintain maximum graphics performance. Note that this guide will also apply to Intel HD4000 graphics when Ivy Bridge Ultrabooks are released later this year. I don’t believe any of the Gen-1 Ultrabooks should be taken off the market to be replaced with Ivy Bridge models but there’s a risk that they will be if manufacturers adopt a two-prong approach with low and high-end Ivy Bridge devices. News just in via The Verge says that new Ivy Bridge Ultrabooks, the UX32A and UX32Vd, will start at $800. Does that leave any space for price drops on the UX21 and UX31? While old stock may go for cheaper prices in Q3 we think it’s unlikely that the UX21 and UX31 will continue on the production line. There are several reasons why iOS devices have always managed to beat Android devices in the touch-responsiveness department. For one, the way that the on-screen elements are rendered is different between the two operating systems. Then there’s the fact that each Android device may use different touch-controllers from one device to the next. Nvidia is taking a stab at upping the touch-responsiveness of Tegra 3-equipped devices by offloading some of the touch input responsibilities directly onto Tegra 3. They call this ‘DirectTouch’. 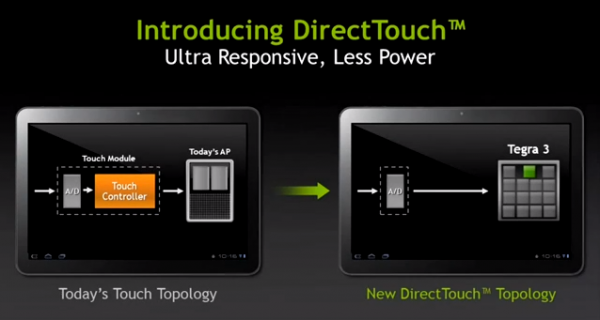 Nvidia demonstrates that the Xoom with Nvidia Tegra 2 can handle around 110 touch samples/second with one finger. As each finger is added, the number of samples/second drops. 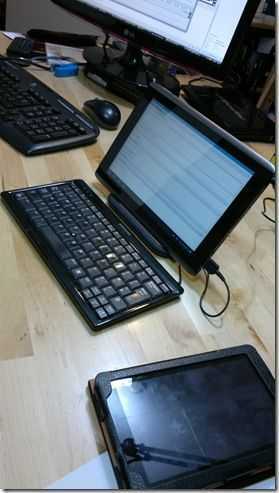 With Tegra 3 and DirectTouch, samples/second nearly double to around 200 for one finger. As more fingers are added, it seems that DirectTouch intelligently scales to keep the samples/second around 200, even with 10 individual inputs! What an increased number of samples/second really means is more accuracy. Increasing the samples/second by 2x as we see here means that the hardware and software are able to record where the input is happening twice as often. At slow speeds, such as scrolling a webpage, this isn’t all that important. However, as the speed of the input increases, the samples/second become more important to maintain accuracy, which is why Nvidia says that this will be particularly useful for gaming. LG has announced, and will be showing off at MWC (starting tomorrow), the Optimus 4X HD. This is LG’s first quad-core phone and uses the Nvidia Tegra 3 platform. It’s likely that we’ll see a number of Tegra 3 smartphones announced and shown at MWC this year. Tegra 3 has actually been on the market for a few months in the form of the Asus Transformer Prime, but we’ve yet to see it available in phone-form. I’m happy to report that the Optimus 4X HD comes pre-installed with Android 4.0 Ice Cream Sandwich which will help really make use of the 1.5GHz quad-core CPU which is equipped with 1GB of RAM. There is 16GB of in-built memory, and the screen is a monster 4.7″ 1280x720p IPS display which, if anything like the LG Spectrum’s screen, is sure to please in terms of colors and sharpness. There’s an 8MP camera on the back and a 1.3MP camera in the front. Additionally, the phone is equipped with 4G LTE; LG will have to be really careful with this phone to ensure that it has reasonable battery life. The battery capacity is 2150mAh. Chippy is on the show floor at MWC starting tomorrow, stay tuned for more! If you were already anticipating the Transformer Prime, I can only imagine you are now that much more excited; you’d be hard pressed to call that demo anything but impressive. I’ll be curious to see some benchmarks, but I’d say Tegra 3’s graphical capabilities are right up there with Apple’s A5 CPU/GPU found in the iPhone 4S and iPad 2. I think it’s great to see that competition has created extremely high performance mobile computing platforms, but when it comes to gaming on tablets, casual play is still where the segment thrives. As soon as you push touchscreen gaming beyond casual, you absolutely need a controller to achieve a reasonable experience. Even though we should be able to connect Bluetooth peripherals (or even USB), it seems that there is not yet a defacto controller to suit the needs of beyond-casual gaming on mobile devices. What say you? Do you find beyond-casual gaming on tablets impractical with only a touchscreen to control them? The Asus Eee Pad Transformer Prime (aka Transformer 2) leaked last month but now it’s all been made official. 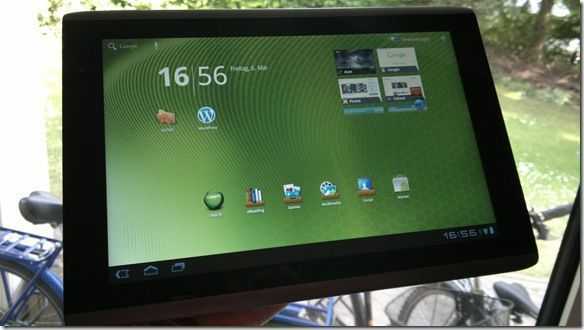 Tegra 3 has been confirmed, and although the Transformer Prime will ship with Android 3.2, they are confirming that it can be upgraded to Ice Cream Sandwich. 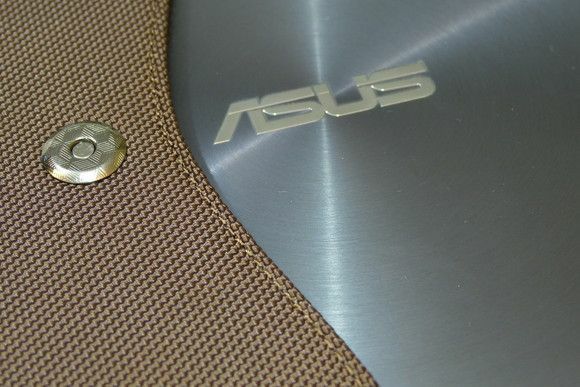 Of course, it wouldn’t be a Transformer without the signature attachable keyboard, and Asus is claiming that the Transformer Prime will get a whopping 18 hours of battery life from a full charge using both the tablet and the dock. 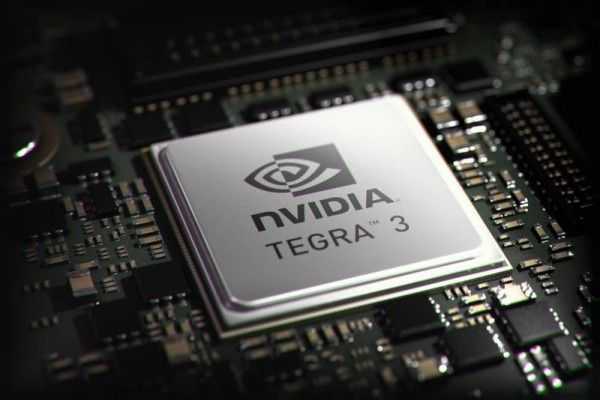 With the Tegra 3 quad-core processor (once codenamed Kal-El), Nvidia says that you can see improvements in speed up to 3x over Tegra 2, with up to 61% less power consumption. The lower power consumption is thanks to a fifth “companion cube” “companion core” that is designed to do the easy lifting, completely shutting down the quad-core CPU when it isn’t needed. Once you start doing tasks that require significant power, everything is shifted from the companion core to the quad-cores and the companion core is shut down. Nvidia calls this process Variable Symmetric Multiprocessing or vSMP. The GPU included in Tegra 3 utilizes 12 processing cores and can automatically convert OpenGL applications and games into stereo 3D, allowing you to hook up your tablet to a 3D HDTV or 3D head mounted display (like Sony’s upcoming HMZ-T1). The Transformer Prime itself is an impressive 8.3mm thick, which will make it the thinnest 10″ tablet available on the market (that is, until Toshiba releases their 7.7 mm thick AT200). 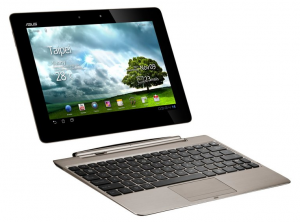 It is also one of the lightest 10″ tablets at 586 grams, though still behind the Galaxy Tab 10.1. This is all without the keyboard of course. The Transformer Prime screen retains the 1280 x 800 resolution and IPS technology used on the original Transformer. 1GB of RAM accompanies the Tegra 3 processor. 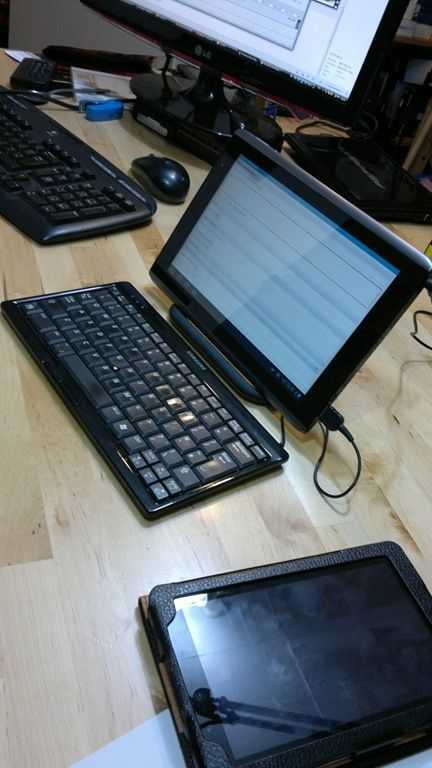 Unfortunately, Asus has not moved the USB port onto the tablet itself, as per Damian’s hopes; you’ll still need transform into the keyboard mode to access the USB port. Unfortunately they’ve actually reduced the count from two USB ports to one, which seems like a step backward considering the good USB peripheral support of Android Honeycomb and beyond. The Transformer Prime alone has micro-HDMI, 3.5mm headphone/mic input, a built in mic, micro-SD card reader, and stereo speakers. The Transformer Prime is Priced at $499 for a 32GB model or $599 for a 64GB model. There are two colors available: Amethyst Grey and Champagne Gold. The keyboard dock, which includes one USB port and a full-sized SD card reader and battery (and will add 537 grams to the Transformer Prime), is optional and will run you an additional $149. Nvidia’s Tegra and Tegra 2 hardware has been quite popular over the last year, bringing powerful CPU and GPU performance to tablets and smartphones in a standardized package. Today, Nvidia is showing off the next version of Tegra, codenamed Kal-El, which will power tomorrow’s tablets and smartphones. Kal-El is the next iteration of Nvidia’s mobile CPU/GPU series and features the world’s first mobile quad-core CPU, and a whopping dodeca-core GPU (that’s 12, folks!). Nvidia is expecting five times the performance of Tegra 2 out of Kal-El! This impressive video demo shows some intense dynamic lighting and real-time physics. 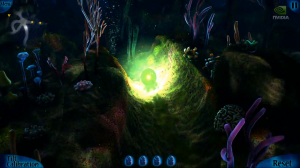 Both lighting and animations are traditionally pre-rendered onto scenes in mobile games and cannot be interacted with in real-time. Nvidia says that Kal-El’s four CPU cores and twelve GPU cores make dynamic lighting and real-time physics animations practical for the first time on mobile devices. In the demo you’ll watch as the demonstrator disables two of the four CPU cores to simulate how the game would run on a dual-core CPU. The results aren’t very pretty as the cores max-out and the framerate drops to at least half of what it was. Returning to four cores shows each core running around 70% and the game playing very smoothly. What’s great is that Nvidia expects the production CPU to be 25-30% faster than the hardware being used for this demonstration! The game will be available on the Android Marketplace (likely through the Tegra Zone application) once it’s complete. Nvidia has been sending out Kal-El samples to production customers since February and expect Kal-El devices to begin production this August. The Acer Iconia Tab A500, a 10 inch Honeycomb tablet arrived today and, as per the ‘law’ I unboxed it straight away for you. Interestingly, it crashed during the first tests! I was messing with an external keyboard at the time but that wasn’t expected. I also found out that there’s only one language installed and that the media player can’t handle WMV or DivX files that I had on a USB stick. Not a good start. The build quality is impressive though and as you can see in this image, I did manage to get the Samsung Q1 keyboard working with it. The mouse didn’t work. The screen has good viewing angles and the speakers are reasonable too. Set-up was, as always with Android, a breeze and working down in my studio I was able to see hotspots that I don’t usually see so the Wifi seems strong. I’ll leave it there for the time being as we’ve got a live session running with the Acer Iconia Tab A500 this evening where we’ll find out everything there is to know. We’ll record some of the session and get it written up for you in a first-impressions post at the weekend. Details for the live session are here. Full Specifications, Links, Images, Reviews for the A500 are here.